<b>** TO VIEW THE MEANINGS AND USES OF THE DROPS, VISIT OUR BLOG - </b> <a href="https://drreckeweg.wordpress.com/2014/10/16/dr-reckeweg-homeopathic-drops-uses-and-benefits"><b>CLICK HERE.</b></a><br> <br> <b>PLEASE NOTE:</b> FREE POSTAGE IS GIVEN ON AN ORDER FOR ONE BOTTLE BUT DUE TO THE WEIGHT OF THIS PRODUCT - AN EXTRA <b>£2.99</b> WILL BE CHARGED FOR EVERY EXTRA BOTTLE ORDERED.<br> <br> <b>Dr. Reckeweg</b> is a family-owned business whose origins can be traced back to the turn of the last century. 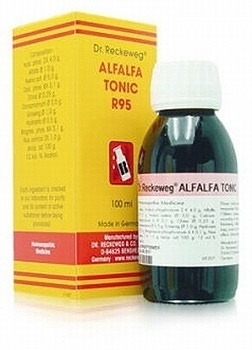 Their drops are produced from raw materials of the highest quality and are strictly manufactured in accordance with the German Homeopathic Pharmacopoeia, the European Pharmacopoeia and comply with international production standards.<br> <br> <b>DOSAGE</b><br> Adults One tablespoon, Children One teaspoonful 3 times daily before meals.<br> <br> <b>INGREDIENTS:</b><br> Acidum Phosphoricum D2 4,0G, Alfalfa 1,0G, Avena Sativea 5,0G, Calcium Phosphoricum D6 0,1 G, China =D1 0,5G, Hydrastis =D 1 0,5G Magnesium Phosphoricum D6 0,6 Nux Vomica D3 1,0G, Panax Giseng =D1 1,0G, Excipients 21,5G, Ethanolum/Aqua Pur. And 100,0 G. 12Vol -% Alcohol.<br> <br> <b>PLEASE NOTE:</b> FREE POSTAGE IS GIVEN ON AN ORDER FOR ONE BOTTLE BUT DUE TO THE WEIGHT OF THIS PRODUCT - AN EXTRA <b>£2.99</b> WILL BE CHARGED FOR EVERY EXTRA BOTTLE ORDERED. PLEASE NOTE: FREE POSTAGE IS GIVEN ON AN ORDER FOR ONE BOTTLE BUT DUE TO THE WEIGHT OF THIS PRODUCT - AN EXTRA £2.99 WILL BE CHARGED FOR EVERY EXTRA BOTTLE ORDERED. Acidum Phosphoricum D2 4,0G, Alfalfa 1,0G, Avena Sativea 5,0G, Calcium Phosphoricum D6 0,1 G, China =D1 0,5G, Hydrastis =D 1 0,5G Magnesium Phosphoricum D6 0,6 Nux Vomica D3 1,0G, Panax Giseng =D1 1,0G, Excipients 21,5G, Ethanolum/Aqua Pur. And 100,0 G. 12Vol -% Alcohol.